July 9, 1921 - January 20, 2007 . The father of an activist opposing the Forest Hill Road widening project died Saturday after being struck by a car as he crossed the road. Macon police spokeswoman Sgt. Melanie Hofmann said a car swerved to avoid hitting 85-year-old Peter Holliday Jr. as he crossed Forest Hill Road after checking his mail just before 3 p.m. But a second car, a 1990 Oldsmobile driven by 34-year-old Malaika Johnson of Macon, struck Holliday, she said. Bibb County Coroner Leon Jones said Holliday was taken to The Medical Center of Middle Georgia where he died later in the afternoon. Holliday's son, Lindsay Holliday, said his father was born and raised in Macon. He lived in the same house on Forest Hill Road for 50 years. "It's a blind curve and people go too fast," he said, adding the posted speed limit is 35 mph. "The cars just kept getting faster and he kept getting slower." Lindsay Holliday, a local dentist and environmental activist, has been a vocal opponent to widening portions of Forest Hill Road. As recently as last month, Holliday spoke out against widening the two-lane road to three- and four-lane sections, telling local politicians the road could be redesigned with roundabouts instead of traditional signaled intersections. He said Saturday's tragedy hasn't changed his opinion. His father also opposed the widening project. "Dad and I were on the same page," Holliday said. Hofmann said the accident is still under investigation. Holliday said his father lived an active life, still practicing dentistry as recently as last week. "He loved his patients and they loved him," Holliday said. Jones said Hart's Mortuary is in charge of arrangements. The posted speed is officially 45mph. 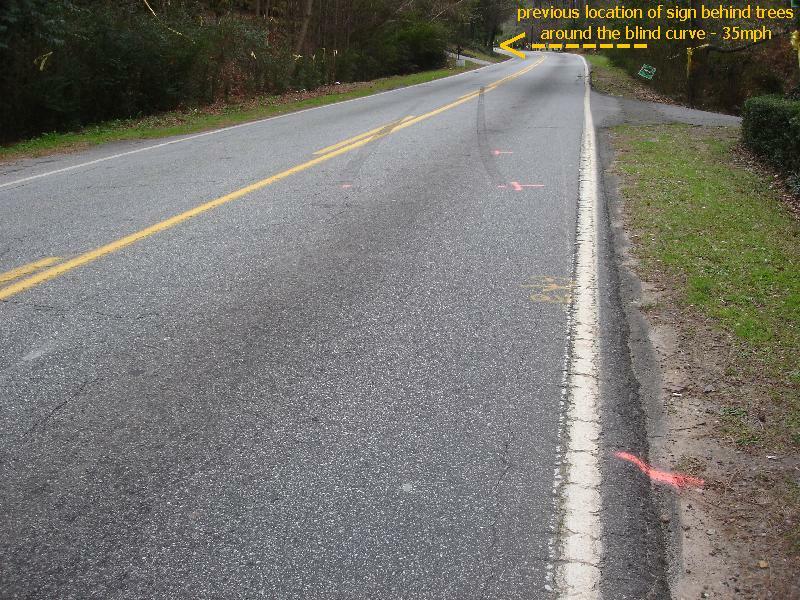 Sometimes there is also a yellow sign "35mph - Curve" that the police tell me is only a "suggested safe speed" since it is on a yellow background. This sign gets knocked down a lot and it was missing yesterday. Posted on Wed, Aug. 29, 2007 - Macon Telegraph - page 1B. The woman accused of hitting an 85-year-old man with her car as he returned from his mailbox in January has been indicted on two counts of homicide by vehicle, according to the Bibb County District Attorney's Office. Malaika Patrice Johnson, 34, struck Peter Holliday with her car on Forest Hill Road on Jan. 20, according to the indictment. At the time of the accident, police officers said a car swerved to avoid hitting Holliday, but a second car driven by Johnson fatally struck him. Johnson was found to be driving under the influence of marijuana and cocaine, according to the indictment. As of Wednesday, records at the district attorney's office showed Johnson had not obtained legal representation. Holliday's son, Dr. Lindsay Holliday, has been a longtime activist opposing the proposed widening of Forest Hill Road. Holliday said his father had been safely crossing Forest Hill Road to check his mail for 60 years prior to his death. He said he believes his father's death could have been prevented had the Georgia Department of Transportation approved an alternative widening plan that would have created a planted median and pedestrian refuge. "He made it across the first lane, Holliday said. "She hit him in the second lane. "Had the road been designed differently it wouldn't have happened." Johnson is scheduled to be arraigned on Sept. 12. A Macon woman was sentenced to serve four years in prison and six years on probation after pleading guilty to fatally striking a Forest Hill Road man with her car. Malaika Patrice Johnson, 35, entered a guilty plea in Bibb County Superior Court this morning to homicide by vehicle in the death of 85-year-old Peter Holliday, said Bibb County assistant district attorney John Regan. 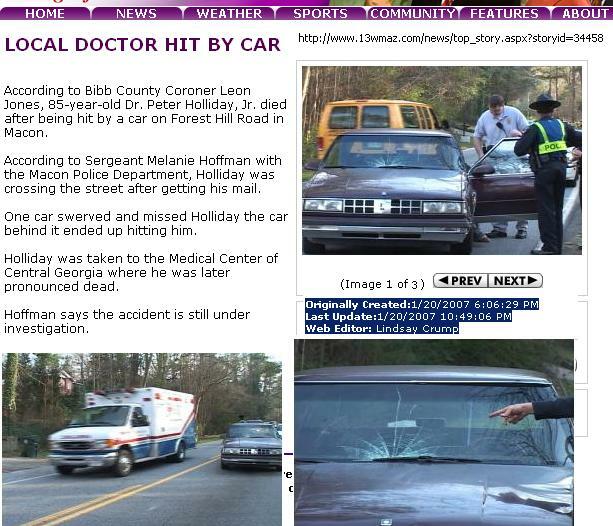 Holliday was struck as he walked across Forest Hill Road after checking his mail Jan. 20, 2007, according to court records. Johnson was found to be under the influence of drugs when she struck Holliday, according to court records. Holliday's son, Dr. Lindsay Holliday, has been a longtime activist opposing a proposed widening of Forest Hill Road. Holliday was struck as he walked across Forest Hill Road after checking his mail on Jan. 20, 2007, according to court records. She's would have gotten life if the victim was walking a dog. I am surprised she got more than 2 years. We don't punish criminals anymore. Instead, we let Mercer Law students argue against their unfair treatment in jail! If it were a man who had done this, he would have got 8-10 years easy. Let me guess, the defense attorney played the "kids without their mom" angle, and the Judge bought it. The court system is starting to make us believe that there isn't much difference in an animal's life and a human life. Lately the sentences handed down in relation to this matter really aren't as far apart as they should be. i hate drunk drivers .. it is a license to kill.. better than shooting some one with a gun.. i wish victims who are now dead at these criminal's hands had as much rights as their murderers..
What kind of drugs? What level of intoxication? What kind of drugs? It does not matter. What level of intoxication? It does not matter. Four years in prison is ridiculous for killing someone! It was a plea agreement not a sentence after a trial so don't place all of the blame on the judge. Johnson committed the crime. She should do more time, but that is the way the system works. Four years is not enough time for someone's life but,enough time for someone to get there life together, get off of drugs,pray and ask God for forgiveness, and most of all forgive yourself. What kind of drugs? Might have been 1 joint she smoked 2-3 week ago. Thats like being convicted of drunk driving cause you got drunk 2-3 weeks ago. Makes no sense. She could be dead straight when the accident occured, but marijuana stays in your system. I don't know if this is the case. Didn't we have a story a few weeks ago about a man getting 6 years for killing a dog? If I remember correctly the guy who killed a dog got six years. Somethings not right here. For once I agree with Mark318. It DOES matter to what extent the drugs were influencing Ms. Johnson. So what were the drugs? How did they influence her? It's easy for us to criticize the judge's decision. Without all the facts, we should hesitate to do so. Perhaps the judge felt she was culpable, but that there were mitigating circumstances or that the offense itself was not as greivous as many of the posters have felt it to be. COMMENT ON THIS STORY AT MACON.COM. Ga Law has 0 tolerance for any metabolite-traces of Cocaine. trace also of THC from 72 hours previous. The cocaine traces automatically make the case a vehicular homicide. No Judge was used for the plea-bargain between the public defender and the public prosecutor. I would like to speak with someone about mitigating circumstance in this case. Please call me, or email. When writing an inmate of the Bibb County Law Enforcement Center, please address your envelope as follows. called public def office ask for Lee R - out till next week. Find the assigned case worker for Ms Johnson is Cheryl Milton(sp? direct phone is 621-5978) who is also out, but message to call me at work. 1-21-09 call back from Lisa Bell 621-5982 assistant to several of the public defenders here. Left message..
4-9-09 spoke with Lisa Bell... refers to case worker Cheryl Milton 621-5978... left message (in court today) CM is in Mental Health Division of Public Defend. Not found on that site. Ragan and I spoke at length. He says that sometimes the inmates name is not listed on the DOC site - for reasons unknown. His info says defendaent got 10 years sentence and it appears she was transferred and is still incarcerated in Atl at the Metro State Pen - and all womens institution. Inmate info diect call number there is 404-656-4661. or 5651 for another division. I called Ms Milton and left a message that I expect her to get me in contact with the inmate for me to write a letter - for her to help me to help her client.